When the Cleveland Cavaliers finally pulled the trigger on a trade for Kyrie Irving last summer, there seemed to be at least one consensus reaction – they got the best possible deal. This was referring to Cleveland’s perspective of the trade. The team was under the gun to move its moody point guard before the season started, which led to many thinking it might accept an underwhelming deal. 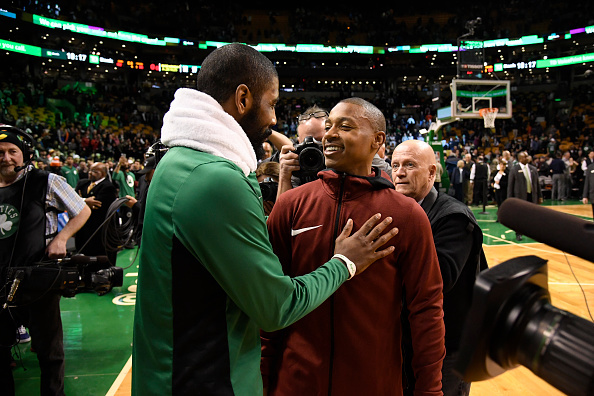 However, many concluded the Cavs’ returns from sending Irving to the Boston Celtics – Isaiah Thomas, Jae Crowder and the Brooklyn Nets’ 2018 first round pick – made the trade as even as possible, with some saying they actually came out on the winning end of the deal. It doesn’t feel that way now. In fact, as the season has dragged on, it almost appears as though the trade was quite lopsided, with Cleveland coming out on the losing end. Sure, we still can’t officially declare a winner yet. However, it’s hard to not be concerned about how this has been shaping up on the Cavs’ end. The biggest name Cleveland received was Thomas, who was coming off a year in which he finished third in scoring, but was also recovering from a bad hip injury. The thought was the Cavs essentially swapped one All-Star point guard for another, with a slight advantage to Boston. Thomas still can’t officially be evaluated, as he’s only played in seven games this season. However, early results don’t imply the drop-off between him and Irving is small. So far, Thomas has been incredibly inconsistent in his time with Cleveland. His first two games of the year were equal parts efficient and impressive, causing everyone to assume he had zero rust after a long hiatus. Since then, his shooting percentage has fallen off a cliff. His hitting 57% of his shots in last weekend’s slaughter at the hands of the Oklahoma City Thunder marked a recent high, as he’s otherwise missing far more shots than he makes. Again, though, it’s too early to get a good read on what Thomas can offer the Cavs. However, even at 100%, he’s clearly a downgrade defensively, and this will remain a major concern through the rest of the season. Making matters worse is what’s happening with the other two pieces of the deal. Four months into the season, the only benefit Crowder has brought Cleveland is his being on a team-friendly contract. Offensively, his average points per game has dropped to its lowest point since 2014. He was expected to provide a boost on the defensive side of the court, but has instead looked helpless more often than not. By his own admission, Crowder has been lost for the better part of the year, which shouldn’t surprise anyone who’s been watching. Hell, even the key piece of the trade – the Nets first rounder – isn’t looking as enticing as it did when the deal was made. The Nets, while hardly an elite NBA team, aren’t nearly as bad as everyone expected. The odds of their pick landing at the top of the draft are shrinking, and there’s a possibility it falls outside of the top five. Worse yet, Cleveland’s continued on-court struggles may force the front office to deal the asset for returns which may not help the team win a title this year, effectively throwing away insurance for LeBron James‘ potential departure this summer. On the other side of the deal, Irving’s attempt to thrive outside of James’ shadow has been beyond successful. Boston is the class of the Eastern Conference, despite the fact it’s been without All-Star Gordon Hayward for all but six minutes of the entire season. Cleveland’s former point guard has shown zero struggles, and looks wiser every day for betting on himself. It’s obviously too early to give a final grade on the deal for either side. Thomas is still getting back into the swing of things, and the outcome of the Brooklyn pick remains up in the air. We’ll have a better idea of where things stand once the season comes to an end. Right now, though, it sure looks like Boston’s season will conclude later than Cleveland’s. This, alone, indicates the Cavs’ returns might not be as impressive as we initially thought.